For every business, a crucial part of daily operation is accurately recording the time that employees spend at work and the payment that they receive for that work. Without this information, a company cannot know what wages its employees have earned over the course of a pay period, and employee hours and earnings cannot be tracked. Traditional time sheet record keeping can be a time consuming and daunting task, but a customizable Daily Timesheet Template provides a simple, efficient and professional way to accurately record and communicate this information from the employees to managers, owners, and payroll personnel. 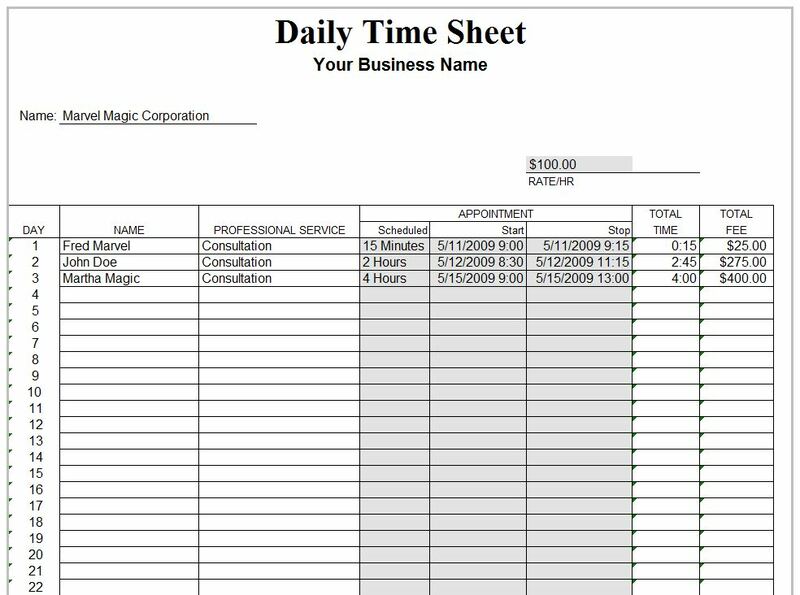 First, customize the Daily Timesheet Template, available on this page for free download, with your business name and relevant company or department information. Customization possibilities include the company logo, phone numbers, address, and email. These custom touches give the timesheet template a neat and professional appearance. Once the template has been customized, save the file. Second, set up the data fields for tracking time worked and total fees paid. Tracking these totals allows the company to accurately calculate how much an employee has earned to avoid over or under-paying workers. Third, set up fields for inserting specific employee information. This should include employee names, the types of service rendered, time and date that the employee is scheduled to work, actual start and end dates and times for each shift, and pay rate for time worked. These clear and concise records simplify the task of payroll personnel and allow for easy reference in the future. Update the Daily Timesheet Template each day to ensure accurate records, and back up the information in multiple ways. Be sure to save completed timesheet files for future reference; this information is invaluable for tax purposes, resolving pay confusion, and for other management and payroll department uses. Refer back to the data to improve company time management, to identify efficient and inefficient workers, and to make better management decisions accordingly. For added organizational benefit in larger companies, use separate Daily Timesheet Templates for different departments. All companies must be able to accurately track employee hours and pay. The Daily Timesheet Template is an easy-to-use, versatile and customizable method that makes the daunting task of filling out time sheets easier and more efficient.